Journalist Pelin Ünker, who was sentenced to over a year in jail over a series of “Paradise Papers” reports published on Cumhuriyet newspaper about offshore companies that allegedly belonged to former Prime Minister Binali Yıldırım’s sons on the tax-haven island of Malta, was not sentenced over her journalistic activities, Yıldırım, now speaker of parliament, said on Jan. 10. “There is no journalistic activity in those articles, but defamation,” he said in his meeting with parliament correspondents to mark Jan. 10 Working Journalists’ Day. Her reports claim the former prime minister had evaded taxes over offshore companies. “This is a serious allegation for a prime minister,” he said, adding that he refuted those claims with documents. “Remaining silent would be endorsing those allegations,” he said in the series of accusations that “targets and slanders” him based on “insubstantial” claims, Yıldırım said. Paradise Papers are leaked confidential documents unveiling off-shore accounts of politicians, businessmen, royal family members and multinational companies, who were allegedly avoiding tax. Ünker had claimed in her news series that the sons of Yıldırım, who is now running for mayor of Istanbul from the ruling Justice and Development Party (AKP), owned five off-shore companies based in Malta. “I fulfilled my journalism job. They were articles about public figures. I fulfilled my job to inform the public. A right of reply had emerged [for Yıldırım]. 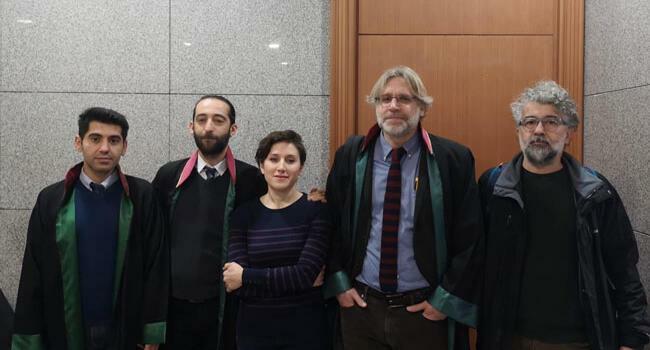 I do not think that the news I did consists a crime,” said Ünker during the final hearing of the trial on Jan. 8 at the Istanbul Çağlayan Courthouse. But the Istanbul 2nd Penal Court of Instance sentenced Ünker on charges of “defamation and insult” and “slandering a public official.” The court also demanded the journalist pays a fine of 8,860 Turkish Liras (around $1,610). Ünker’s sentence was not postponed. She said she would appeal the local court’s ruling with a higher court. Meanwhile, President Recep Tayyip Erdoğan celebrated the Working Journalists’ Day, which is celebrated annually to mark a law passed on Jan. 10, 1961 [Law No. 212] that protects the rights of journalists. “As the extent of freedom of those working in the press, journalists, and news people increases, then the democracy of the country becomes more powerful,” he said in a written statement. In a statement, the Journalists Union of Turkey noted that Turkey ranks 156 among 180 countries in press freedom rankings. “Some 30 percent of journalists are unemployed and those with low wages are working in precarious conditions. We do not find it appropriate to celebrate this at a time when 141 colleagues are behind bars and hundreds of cases are brought against them,” said the union.